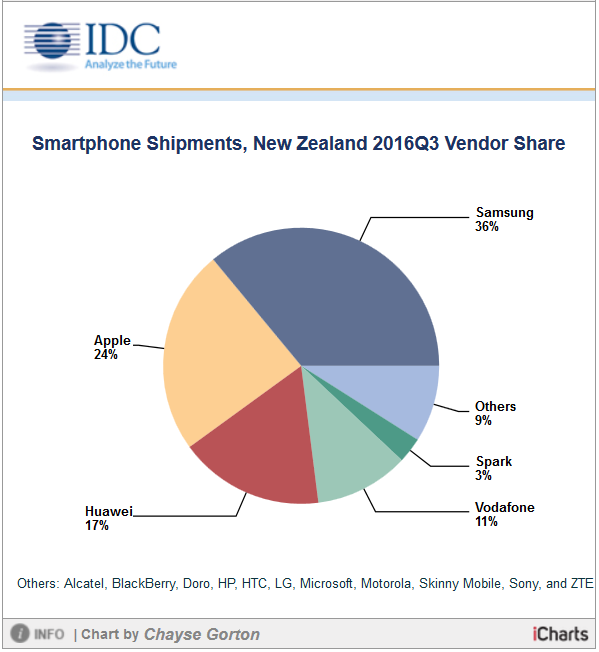 AUCKLAND, 7th DECEMBER 2016 : According to IDC’s recently published third quarter smartphone shipment results, tracked from July to September 2016, Spark has pushed Alcatel out of the top five shipping vendors, by achieving three percent share of smartphones shipped. Alcatel had previously held the fifth position for all of 2016. Samsung (36%) continue to have the highest shipments, followed by Apple (24%), Huawei (17%), and Vodafone (11%). Spark's growth comes at a time when the New Zealand smartphone market declined nine percent year on year. Vendors shipped a total of 410,000 smartphones during July to September 2016, down from 449,000 smartphones shipped over the same period in 2015. If Skinny Mobile (a division of Spark New Zealand) smartphones and the ZTE/Spark co-branded Pro model are included, then Spark shipments increase to seven percent share of the New Zealand Smartphone market. Spark has not been one of the top five smartphone brands in New Zealand since re-branding from Telecom, which occurred in the second half of 2014. The most recent quarter when the telco was in the top five was 2014Q1, here Telecom achieved eight percent share with its three Telecom branded devices. Spark reduced its phone range from three devices in 2014Q1 to one by 2016Q1, contributing to the lower share achieved over recent timeframes. Spark launched its new range of phones, made by ZTE, in 2016Q2. The new line-up consists of the Spark Lite and Plus model, and still includes the R84. Including Skinny Mobile and cobranded devices increases the total Spark smartphone range to six devices. Chayse Gorton, Client Device Analyst for IDC New Zealand, says the low-end smartphone market appears to be consolidating towards popular Android vendors and telco home brands. Here Samsung, Huawei, Vodafone, and Spark (including Skinny and cobranded devices) account for 94% share, up from 70% in 2015Q3. Spark and Vodafone have been fiercely competitive in fixed and mobile services to date, and now appear to be increasing their focus on own branded smartphone devices. Although Samsung is expected to maintain the top rank, as they overcome publicity issues relating to the recent Note 7 recall, low price smartphones are taking a considerable share of the market, hence it will be worth watching how much share Spark and Vodafone capture in the competitive holiday season.